Hey to all coffee lovers out there! 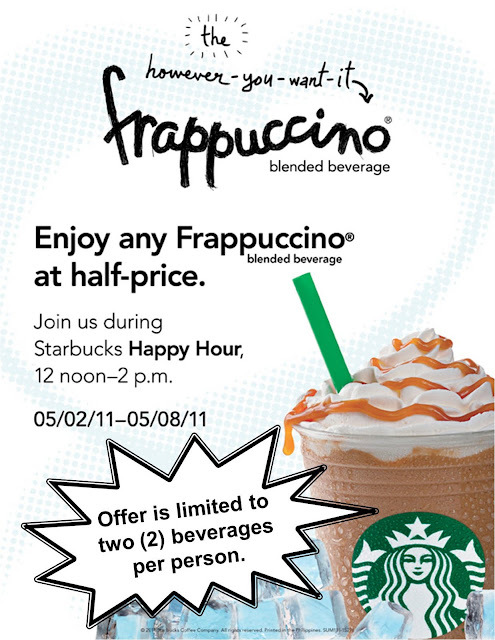 I know the weather has been quite hot and humid lately and Starbucks certainly must have taken noticed because they have offered half-price off on any "however-you-want-it" frappuccino during Starbucks happy hour from 12 noon - 2 pm. Starbucks coffee frappuccino offer is only up to May 8 only and a limit of 2 beverages per person only. I haven't availed of it yet because I only found out about it like right now, so I'll definitely try to get me my good old Starbucks frappuccino ice blended coffee drink. This here is my favorite! Photo credits go to Starbucks Philippines Facebook Page.